Sports run in my blood. Both my parents were collegiate scholarship athletes and long advocated that if I was to afford a postsecondary education at a University that it would have to be on the back of my own athletic full-ride. In the first grade I was bribed to start playing Tee-Ball with a box of unopened baseball cards to begin tapping into my athletic potential. As a third grader in flannel shorts, I started playing in the Boys and Girls Club basketball league. I played sports, both organized and recreationally, throughout childhood, into high school and beyond with some success. But looking back, as much fun as it was to play, I think I was always equal parts athlete and sports fan at heart. As a kid I played out entire Major League baseball seasons in my front yard using a wiffle ball bat, baseball glove, tennis ball and a box score inspired imagination. I loved going with family and friends to Jack Murphy Stadium hearing “Line Drives and Stolen Bases, Diving Catches, We’re Goin’ Places, C’Mon!” before the announcement of the Padres’ starting lineup. I would constantly beat out the Pistons and Celtics in my driveway for the Larry O’Brien Trophy as I became Magic, Kareem and Worthy. I recall repeatedly chanting “Go, Chargers, Go! 6 and 0!” before climbing into bed as the Bolts got started on their only Super Bowl season in ’94-‘95. Sports were more than a pastime for me; they were part of my identity. It’s been a while since those days. Making the decision to get rid of cable years ago certainly drastically reduced time spent watching sports, but for a good portion of the last decade I still found solace in the box scores. At the end of a long day or when avoiding important tasks, ESPN.com or CBS Sportsline provided a window into another world. A world where “pitchers and catchers report” is synonymous with hope and the Opening Day bunting whispers anything is possible. I found this to be especially true every time I moved farther away from home. As awful as the Friars have been, without a No-Hitter, a batter hitting for the cycle or a World Series trophy since their inaugural season in 1969, as heartbreaking as the Bolts have been over the past decade with McCree season ending fumbles and Kaeding missed field goals in the playoffs, these were my teams. Checking the scores, reading the game recaps, watching the highlights were all measures of solidarity with friends and family in America’s Finest City. When Jaime and I were first married I would frequently sit in our Montana apartment literally watching a pitch-by-pitch Gamecast of Padres games on the internet. For non-sports aficionados, this basically entails sitting by yourself waiting for small dots and sentence fragments to appear on the screen and relay what is happening in a game you are not actually watching. Thrilling, no? In the years to come we would move four times and add four children to our growing family. I slowly came to admit that in my life circumstance, spending significant amounts of solitary time watching other people playing sports was irresponsible when I have a family of my own that needs my limited energy and attention. Thus, my 2014 New Year’s Resolution was to stop watching sports. I was not going to stop watching sports because they were evil. I was going to give up watching sports because I had become dependent on them and my addiction had become an evil. If sports were in my blood, then perhaps it was time for a transfusion. I had also become concerned at the role sports have come to play in our American culture and society. Is it possible that our major sporting leagues and events such as the NFL and Super Bowl are the magician’s wiggling fingers on one hand to draw our attention away from the other covertly covering the severity of our nationalistic xenophobia and military industrial complex? But as happens with addicts, my inner voice of rationalization was at the ready once treatment had been seriously proposed. Aren’t sports a great source of recreation and bonding? Sports are a form of social currency – if I give them up, I will lose opportunities for relationship building and a basis for camaraderie. What if my team finally wins after three decades of disappointment? What about the moments that transcend sport such as a reconstructed Drew Brees and the Saints providing a welcome distraction and Super Bowl ring to rebuilding New Orleans post-Hurricane Katrina? I resolved that I was ready for an alternative rest. Note: College athletics would not apply. Not being a college football guy, I spend zero percent of my Autumn Saturdays watching football. However, the Men’s NCAA Basketball Tourney, aka March Madness, is one of my favorite things ever (in large part to my kids bracket picks each year). I agreed I would not watch any regular season NCAA games, but for March and March only, all bets would be off (or should I say on). Likewise, from the outset I granted myself permission to watch the 2014 World Cup in Brazil as I am not normally a huge Fútbol fan, and the World Cup is both a global and time-limited event. #2 I could however talk about sports with others, and if others were to inform me of an outcome of a particular game or play, then I would be able to engage in that conversation (Similarly, if someone made a comment on social media about a game that would be fair game – though following teams on Facebook etc. would not be allowed). # 3 Should there be a good opportunity to hang out with a friend revolving around a sporting event or attend a sporting event live, consideration would be given to allowance of a limited exception to Rule #1. The goals weren’t meant to eliminate sports from my life, just to eliminate my dependence on them. Test number one came early with the Chargers improbably making the playoffs and scheduled for a first round game at Cincinnati in the first week of January. I got some grief about my decision not to watch, follow or read anything about the game. I did happen to call my brother Eric late in the day just to “see how he was” and found out we had won, but received little additional detail. I was saved any further temptation when San Diego lost the following weekend. March Madness came and went with my 3 year old daughter Lucy besting the entire family with her bracket picks on the back of a UCONN National Championship. The family winner gets to pick the location and lunch menu of their choice. Lucy went with Peanut Butter and Jellies at the local children’s museum KidCity. Yes, I lost to a toddler and it was awesome. I didn’t miss much in the Spring with Lakers eliminated from playoff contention by March. Though San Diego State alum Kahwi Leonard apparently reportedly played out of his mind as part of a beautiful Spurs team performance in the NBA Finals that thwarted the Heat attempt at a 3-peat. Maybe I’ll catch it on ESPN Classic someday. My heart stung a bit not watching on baseball’s aforementioned Opening Day, which should easily outdistance Columbus Day as a Federal Holiday. No qualms not paying attention to the mediocre Padres though. Early in the season Matt Souto came over and started talking baseball. I informed him I wasn’t watching this year, but that after a quarter-century of supporting for the Padres I could probably guess their record. Matt informed me San Diego’s season was 19 games in, I figured that likely meant we would be about 9-10. Nailed it. 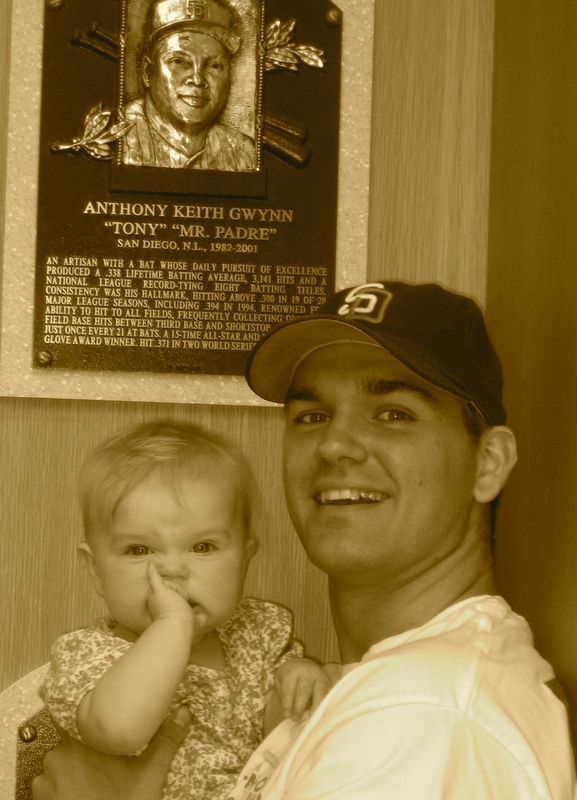 My first real Major League Baseball news of the year came as a result of the unfortunate passing of Mr. Padre himself. Tony Gwynn lost his battle to cancer this past June and an entire city and sport fell silent. The following month it seemed no one was silent as LeBron James announced he would be leaving Miami to return to his hometown Cleveland Cavaliers. I’ll confess this seemed bigger than sport, a narrative that transcended the NBA into meta-Prodigal Son territory. Four years after making himself a spectacle and a fool with The Decision, the best basketball player in the world was this time quietly making the tough decision, the right decision, to go home to Ohio in an effort to bring a title home to one of the few U.S. cities with a more pathetic pro sports history than San Diego. I followed the story, but there were no games being played so I considered myself in the clear. Football season rolled around and I backed out of all Fantasy leagues. Since I started playing Fantasy Football back in 2001, I have learned that most often the real Fantasy isn’t the make believe stat-based point system as much as the idea any time invested after the draft is actually yielding deeper relationships with any of the folks your playing with. Competitive juices end up far more likely to bring bad blood than a sense of deeper friendship and thus I signed myself up for a season-long bye from even the family league. I bequeathed my team “Christopher Walken” to my little sister Miranda and did not miss playing. In fact, without Fantasy Football as a distraction I went entire stretches of the season actually present enough with my family and church family that I didn’t even know who the Chargers were playing, let alone if they won. It was liberating. In the meantime, my sister brought more cowbell and won the league title in her first attempt. In the end, it turned out to be the Kansas City Royals that made me officially relapse. 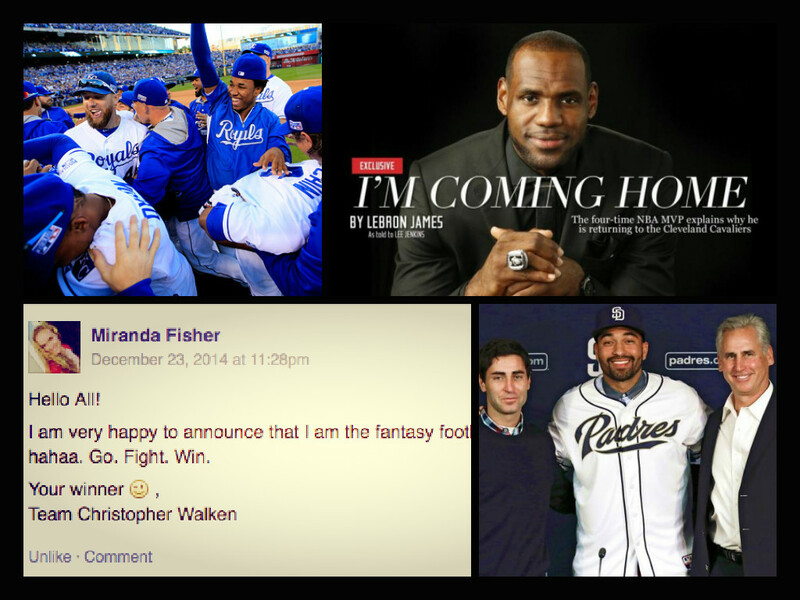 In the end, LBJ would open the door, the Royals would cause relapse and new Padres G.M. A.J. Preller would provide hope. Little sis takes over and wins the Fantasy League upholding the legend of Christopher Walken! If new General Manager A.J. Preller’s aggressive offseason moves pay off in similar fashion for the Padres in 2015, I’ll be in a kissing mood myself. In the end, I almost made it a year. Seems I can’t get sports out of my blood entirely after all. But I do feel more in balance and that the progress made in addressing my dependency on sports was a step in the right direction for our family. A big league challenge to outsmart a growing dependence on my smart phone.